On Aug. 31, 1876, William Herndon, Abraham Lincoln’s last law partner and biographer, spoke to the ninth annual meeting of the Old Settlers of Sangamon County. Here is part of his speech that recounted the changes seen in farming techniques over the 50-plus years that had elapsed since Europeans and African-Americans had begun to move into the Sangamo country. Agriculturally, the sickle gave its place and power to the cradle, and it in time gave its place and power to the reaper. The wooden mould board plow gave place to the iron one, and the common little bar shear gave place to the shovel, and it to the double shovel, and it in turn to the cultivator. The short old Dutch-English scythe gave place to the blacksnake, and it in turn gave up its place to the mower. In these cases, as in a thousand others, the muscles of man was relieved by the muscles of the horse and the powers generated by mechanics, and so it is and ever will be, and yet we in the West are hewers of wood and drawers of water, and yet I dare not say “and so it is and ever will be.” God forbid. The wooden flail gave place to the treading, round-going ox, and he to the thresher. The cotton sheet, in a storm of wind, cleaning the grain, was succeeded by the fanning mill, and all these gave up their place and power to the threshers. The wooden rake has been succeeded by the horse rake. 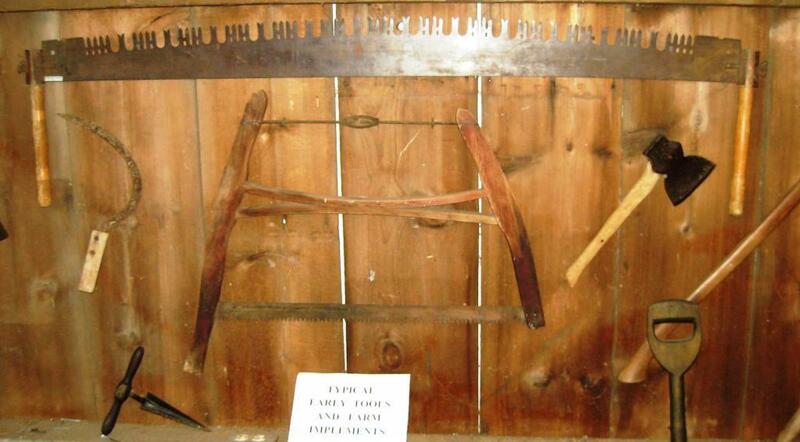 The whip-saw has given up the ghost before the mill-saw; the muscles of man to the forces of nature. Originally, we sent letters and messages by horse, now we send them by steam and electricity, as it were, beating in speed, time itself. So we have lived, are living, and will continue to live. The past is nothing, the present is nothing, the great future will be all. From the History of Sangamon County, Illinois (Inter-state Publishing Co., 1881). This entry was posted in Agriculture, Early residents, Farming, Histories, Prominent figures. Bookmark the permalink.